The Stress Tolerant Maize for Africa (STMA) project has identified seed companies in its target countries, (Nigeria, Ghana, Mali, and the Republic of Bénin) in 2016 and empowered them with the necessary funding support and technical capacity and capability to produce breeder and foundation seeds at scale. In addition, a total amount of 23,700 metric tons of certified seed of multiple stress tolerant maize varieties and hybrids released by the project over the years in the different countries was produced by selected seed companies in 2016. This amount of seed exceeded the target production of 21,000 metric tons set by the project for the year. 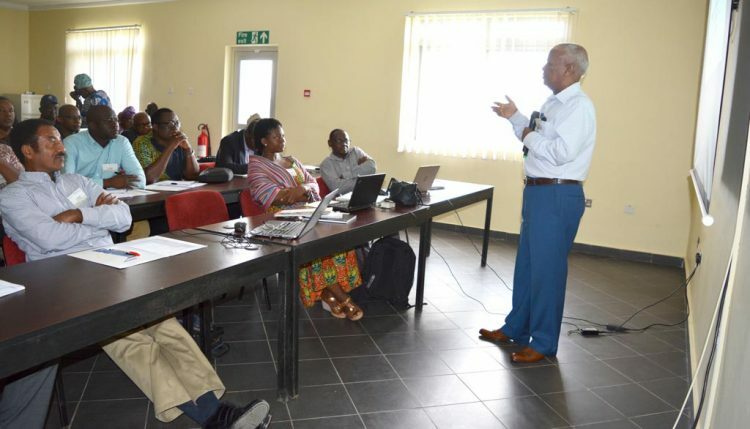 STMA holds annual planning meeting in IITA, Ibadan, Nigeria. Stakeholders who convened in Ibadan on 2—5 May for the project’s annual planning meeting, said the move was necessary to motivate seed companies to serve farmers more effectively and efficiently. The 4-day planning meeting also detailed progress in increased commercialization of multiple stress tolerant maize varieties in the target countries and drew strategies for implementing partners’ work plans for 2017. “An important strategy of the STMA project to contribute to increased maize production and productivity in the partner countries is to supply adequate quantities of Early Generation Seeds (EGS) of released hybrids to private seed companies. STMA aims to support and commensurately strengthen various categories of seed companies in its network, with the ultimate goal of ensuring that certified seed of most promising varieties are always readily available to farmers,” said Baffour Badu-Apraku, IITA Maize Breeder. STMA focuses on developing improved multiple stress tolerant maize varieties that effectively address emerging and future production challenges, while increasing genetic gains. It also pays considerable attention to scaling out these new products and knowledge to beneficiaries in project member countries. Robert Asiedu, Director, Research for Development, IITA West Africa lauded the stakeholders on the progress made in maize research and encouraged them to keep upholding IITA’s legacy. “IITA has not been working in isolation; we have 50 years of partnership and success stories. You have done a good job in the improvement and release of maize varieties. These have resulted in tremendous progress. Let us do better and expand the impact of our hard work,” Asiedu said. Abebe Menkir, IITA Maize Breeder, corroborating the need to promote diverse multiple stress tolerant varieties through different channels, emphasized that it was necessary to collaborate with national and regional initiatives to build the capacity of partners to market the multiple stress tolerant hybrids. The STMA project also promotes the adoption and commercialization of improved varieties and hybrids with tolerance to drought, low soil fertility, heat, as well as varieties with resistance to diseases and pests affecting large maize production areas in West Africa.